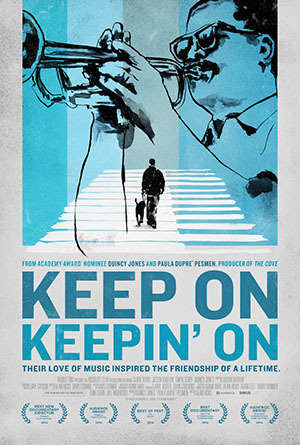 On October 3, 2014, the documentary Keep on Keepin’ On will premiere in New York. The film documents the ongoing relationship between trumpet legend Clark Terry and his protégé, Justin Kauflin, a blind prodigy who is seventy years his junior. First-time director Alan Hicks – also a protégé of Terry – does a remarkable job of giving the viewer an inside look at the trials, tribulations and triumphs of Terry as he copes with aging and the ravages of chronic diabetes and Kauflin, a brilliant pianist and composer who suffers from acute performance anxiety. As the clock ticks, we watch Terry and Kauflin tackle some of the biggest challenges of their life, albeit from opposite sides of the spectrum. The camera follows Kauflin as he feverishly prepares and participates in the Thelonious Monk International Jazz Piano Competition, where he is chosen as a semi-finalist and Terry – in a segment that is painful to watch – as he is faced with the prospect of having both of his legs amputated in order to survive. Without giving too much of the story away, Terry and Kauflin are survivors who live their lives according to one of Duke Ellington’s favorite principles, “There are two rules in life: Rule #1 is don’t quit. Rule #2 is don’t forget rule #1. Keep on Keepin’ On is not a jazz documentary film, however it touches on Terry’s long and illustrious career through the use of lively passages from Terry’s autobiography titled Clark: The Autobiography of Clark Terry , illustrations, rare historical footage and commentary by Gwen Terry, Quincy Jones, Herbie Hancock, Mulgrew Miller, Bill Cosby, Wynton Marsalis, Christian Mc Bride, Dianne Reeves and Miles Davis, who sing his praises. For those who are not familiar with Clark Terry’s long and illustrious career he is a prolific trumpeter and pioneer of the flugelhorn. A short list of his credentials include, Jazz Ambassador to the U.S. State Department, NEA Jazz Master with sixteen honorary doctorates and the keys to several cities and a knighthood in Germany. But perhaps his greatest triumph is coaching and mentoring thousands of students who will go on to teach thousands of students, in an endless cycle. If indeed, “The value of a man resides in what he gives and not in what he receives,” Clark Terry is a man beyond measure.